The roads and sites in the PHU area are caliche. A project to add pavement and cement pads is being routed. The FHU area is also caliche, but with cement pads (see pictures.) Awaiting fund approval to replace the washer that recently became inoperative in the laundry room. Please immediately contact the camp host or staff if the grounds need attention or an occupant is violating the pet policies. 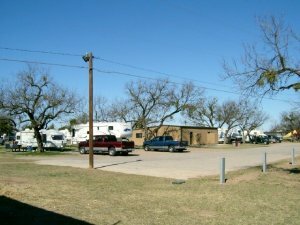 Or, feel free to call the Recreation Director personally at 325-654-5643.